The "Torun portrait" (anonymous, c. 1580), kept in Toruń toun haw. 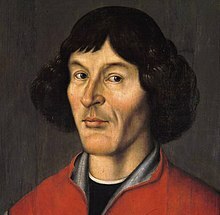 Nicolaus Copernicus (in Laitin; German: Niklas Koppernigk, Pols Mikołaj Kopernik); 19 Februar, 1473 – 24 Mey, 1543) wis a Pols astronomer, mathematician an economist that cam up wi the heliocentric (Sun-centred) theory o the solar seestem in a form detailt eneuch tae mak it scienteefically uisefu. Copernicus wis born in 1473 in the ceety o Thorn (Toruń) in Ryal Proushie. There's a story that the first prentit copy o De revolutionibus wis pitten intil Copernicus's haunds the same day he dee'd, sae that he coud say guidbye tae his opus vitae. They say that he waukent frae a coma, keekit at his beuk, an dee'd. ↑ The auldest kent portrait o Copernicus is that on Strasbourg astronomical clock, made bi Tobias Stimmer c. 1571–4. Accordin tae the inscription next tae the portrait, it wis made frae a sel-portrait bi Copernicus himsel. This has led tae speculation that the Torun portrait mey be a copy based on the same sel-portrait, but its provenance is unkent. André Goddu, Copernicus and the Aristotelian Tradition (2010), p. 436 (note 125), citing Goddu, review of: Jerzy Gassowski,Poszukiwanie grobu Mikolaja Kopernika in: Journal for the History of Astronomy 38.2 (May 2007), p. 255. Copernicus an Astrology - A reliable wabsteid frae Cambridge Varsity describin Copernicus' astrological wark. De Revolutionibus, 1543 first edition - Hale deegital facsimile, Lehigh Varsity. De Revolutionibus, autograph manuscript - Hlae deegital facsimile, Jagiellonian Varsity. "Chasing Copernicus: The Book Nobody Read". - Was One of the Greatest Scientific Works Really Ignored?. All Things Considered, NPR. March 4, 2004. Wikimedia Commons haes media relatit tae Nicolaus Copernicus. This page wis last eeditit on 28 Mey 2017, at 14:10.